North Korea will send one of its highest ranking figures, General Kim Yong-chol, to the closing ceremony of the Winter Olympics in Pyeongchang. 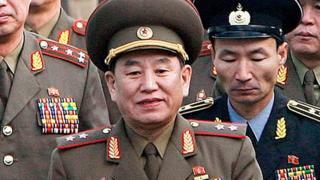 Gen Kim was the North’s intelligence chief, and is believed to have plotted several attacks on South Korea. North Korea’s attendance at the Winter Olympics is seen as a thaw in tense relations between the two Koreas. However, there are concerns Pyongyang has been using the event simply to improve its international image. US President Donald Trump’s daughter, Ivanka, will be leading the US delegation to Pyeongchang over the weekend. However, South Korean officials say there will be no formal meeting between North Korea and the US at the event. Are North and South Korea friends again? Gen Kim leads North Korea’s department for inter-Korea relations, and used to head its spying agency, the Reconnaissance General Bureau. The agency was accused of masterminding attacks on South Korea, including the sinking of the Cheonan navy ship which killed 46 South Korean sailors in 2010. His delegation will stay in South Korea for three days and is expected to meet South Korean President Moon Jae-in. Earlier this month, US Vice-President Mike Pence attended the opening ceremony of the Winter Olympics, while North Korea leader Kim Jong-un’s sister Kim Yo-jong represented Pyongyang. US officials say they were due to meet during the Games, but North Korea pulled out at the last moment. North Korea has been widely condemned for its repeated testing of nuclear weapons and conventional missiles. The US – among others – has warned against easing pressure on the North Koreans to abandon their nuclear programme and improve their human rights situation. Who owns ‘lucky money’ in red envelopes?